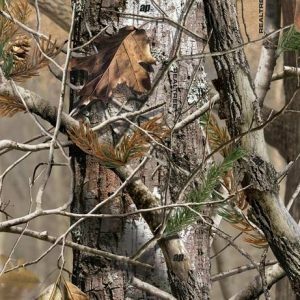 The concept behind the Realtree® brand is to layer images of twigs and leaves over a vertical bark background to create a three-dimensional appearance that would match a variety of terrain. We developed approved Realtree/Jordan Outdoor Enterprises patterns in Hardwoods, AP, APP Pink, and Blaze. They come in a variety of backpack, belt, and pet restraint weights, and are available in sizing widths of 19mm, 25mm, and 38mm. All products are available with any value-added option. Contact us today for any questions! “The all season, all-region camo for timbered areas.” Realtree Hardwoods HD® camo is the “Season and region” option hunters asked for. It achieves the ultra-realistic timbered patterns and is proven to be effective and versatile. The pattern is designed to span seasons and even works in the depths of winter. “Works just about everywhere a hunter needs to hide.” Realtree AP® camo is neutral, open, contrast-filled, and realistic. Everything a hunting camo needs to be versatile and effective. The AP means all purpose. Realtree AP Blaze® orange camo offers the combination of color and camouflage. The blaze orange camo effectively reveals hunters to other humans, while concealing them from the color-blind eyes of deer.